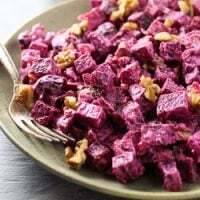 This Beet Salad with Walnuts is a perfect combination of earthy beets, sweet prunes, and crunchy walnuts. It’s a very simple recipe made with only four or five ingredients. It’s a great salad to make in advance as it tastes even better the next day. 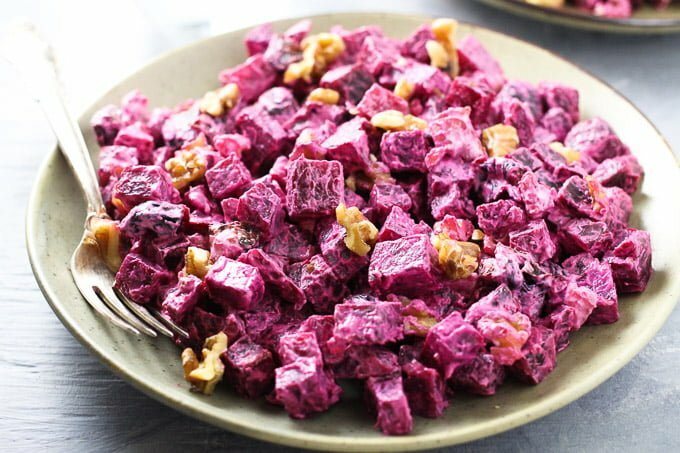 This article for Russian Beet Salad with Prunes and Walnuts was originally published on Curious Cuisiniere. This beet salad is very popular in Russia. It’s usually prepared during the colder months of the year and often served alongside other salads and appetizers for holiday gatherings. You will also find it on the restaurant menus and at the ready-food counters in grocery stores. It tastes great as a side dish served with meat, poultry, and fish. Prunes aren’t used very often in salads, and it might seem a bit strange to combine them with beets. But, they add a subtle sweetness and a pleasant mouthfeel to this salad. If the prunes you are using are hard, soak them in hot water for about 10 minutes or until they soften enough to be cut into quarters. At the same time, make sure they don’t start falling apart in the water. If you don’t like prunes or don’t have them on hand, this salad is also often prepared with raisins instead of prunes, or you can use both. The salad is made with cooked beets. The beets should be cooked whole using any method of your choice. You can roast, boil, bake, or steam-roast them. My favorite method of cooking beets is steam-roasting them. 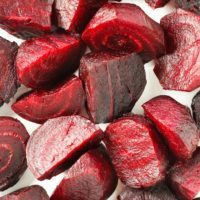 I find this method the easiest and fastest method of cooking whole beets. To steam-roast the beets, place them in a baking dish. Add about 1/2 inch of water and cover with aluminum foil. Place them in the oven and cook for about 1.5 hours or until the beets can be easily pierced with a fork. Let the beets cool before handling them then peel and dice or grate them for the salad. 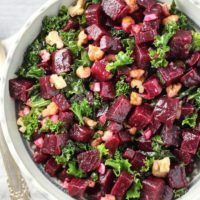 If the idea of cooking beets intimidates you, check out my guide to cooking beets where I explain in detail how to buy, store, cook, peel, and serve them. 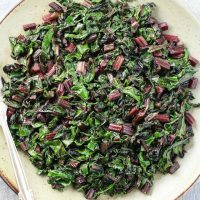 Although the combination of beets, prunes, and walnuts lends this salad a pretty distinct flavor, you can intensify it even more by adding garlic. The garlicky variation of the salad is prepared just as often as the basic version and nobody really knows which recipe came first. When I asked my Russian friends which version of the salad they prefer, the opinions were divided pretty equally. I personally like both versions. The only tip I have is to use only prunes and no raisins when making it with garlic. 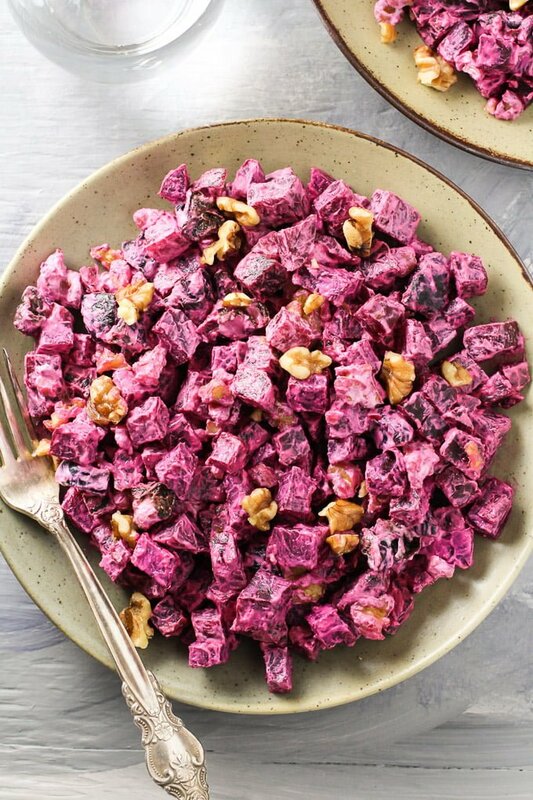 IS THIS BEET SALAD WITH WALNUTS HEALTHY? The main ingredients of the salad are very nutritious. Beets are a very good source of dietary fiber, folate, potassium, and manganese. Prunes are also high in fiber and are a very good source of Vitamin K. Walnuts contain high amounts of omega-3 fatty acids. And garlic contains antibacterial and immune boosting compounds. However, the salad is traditionally prepared with lots of mayonnaise which can quickly turn the otherwise healthy dish into a calorie bomb. So, I personally prefer to replace at least half of the mayo with sour cream or yogurt or use a healthier mayonnaise. 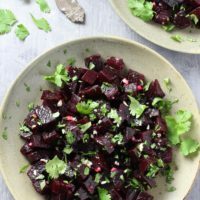 With its bright magenta color and the distinct flavor, this salad is definitely for those who are open to culinary adventures. 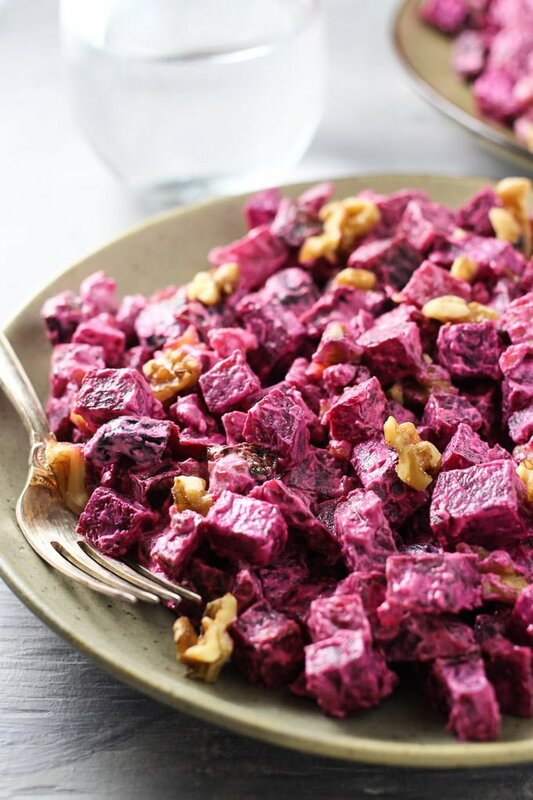 What do you think about this Beet Salad with Walnuts? Is this something you are open to trying? Have you tried it before? Let me know your thoughts in the comments below! 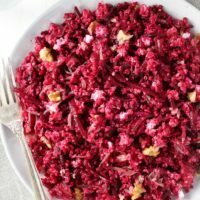 This red beet salad with walnuts is delicious and filling. The recipe is very easy to make using five simple ingredients. 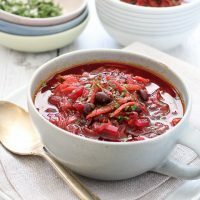 Gluten-free, vegetarian, and perfect for a meal-prep. To cook the beets, pre-heat the oven to 400F. Place the beets into a baking dish. Add about 1/2 inch of water. Cover the dish with aluminum foil making sure the foil doesn’t touch the beets. Leave a small opening at one corner to allow the steam to escape. Place the baking dish into the oven and bake the beets for about 1.5 hour or until you can easily pierce them with a fork. Let the beets cool completely before peeling them and making the salad. To make the salad, slice the beets into small dice or you can also grate them. Place the beets into a salad bowl. Add the walnuts, prunes and sour cream. If you are making the garlicky version, add the garlic too. Season with salt and mix to combine. Chill in the fridge for about 30 minutes before serving. This salad also tastes great the next day. Store in the fridge in a glass container with a tight lid for up to 48 hours. The nutrition information is a rough estimated for 1 out of 5 servings. It was calculated for the version without garlic using 1/4 cup of mayo and 1/4 cup of sour cream. « What is Glycemic Index?